Almost every time I speak about employee engagement, someone in the audience asks me what they can do to improve engagement as soon as they return to their organization — the day they get back to work. I’m gratified my message—improving engagement is important—is getting through. I also appreciate the enthusiasm of the questioners. But I mentally scratch my head at this question because it suggests the belief there are short-cut, one-size-fits-all solutions to improving employee engagement. In contrast, each organization needs to first understand what the specific issues are in its own workforce. This requires data, ideally through regular employee surveys supplemented by other data sources such as pulse surveys, turnover statistics, focus groups, exit and stay interviews, performance evaluations, etc. The organization can then act based on evidence. By one estimate, there are about 90,000 public-sector jurisdictions and organizations in the U.S. alone. Not sure who has counted these organizations but clearly there are a lot of them. Each is unique, with its own mission, strategy, culture, structure, finances, politics, stakeholders and so on. Despite what some may argue, I don’t believe there is any one particular action, or set of actions, that will improve engagement in each of these thousands of public-sector organizations. There’s a book entitled 180 Ways to Improve Engagement. It’s a great collection of potential actions to improve employee engagement, but good luck figuring out which will work in your organization without understanding what the issues are in your own workforce. This requires data. In other words, there are no shortcuts to improved engagement. Even in the same jurisdiction or organization, the issues—and solutions—can differ. For example, when we conducted an engagement survey for a large city, we found significant differences in the levels of engagement across city departments. Not surprisingly, the drivers of engagement also differed dramatically. This city’s librarians have different issues—and solutions—than its public works employees. That’s why each organization needs to measure its own employees’ level of engagement, understand what drives their engagement and then act based on this knowledge. But how does this square with research which reveals what drives engagement more generally, across multiple organizations? For example, my Institute’s research has shown the four most important drivers of engagement (statistically) are leadership/managing change, employee development, the work itself and appreciation/recognition. While it’s interesting and useful to know what these macro predictors of engagement are, each organization needs to understand its own drivers. Our national survey revealed leadership/managing change was the top workplace driver of engagement, for both the public and private sectors, and across government (federal, state and local). Now, does this mean that every organizations in the U.S. should immediately focus on this driver to improve engagement? That’s because this driver may not hold for all organizations. Plus, we need to drill down to understand the components of the driver. When we analyze engagement survey results, we identify which of these questions are the most-important drivers of engagement (as long as we have a least 100 responses). In this way, we help the organization understand which specific aspects of the leadership dimension are most important to employee engagement. Is it leadership visibility, communication, change management, decision-making, etc.? These are important distinctions that should influence actions. And this is true for other dimensions that may be drivers — it’s important to drill down to understand what employees are really saying. And then take action in response. Many organizations also do further research after receiving survey result. Focus groups, for example, allow the organization to understand the reasons behind employees’ survey responses. 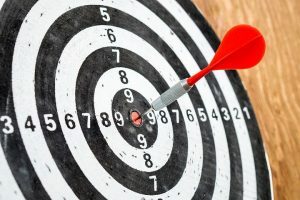 Without data and analysis, improving engagement is like shooting darts — you do the best you can to hit the bullseye. Even if you’re good at darts, which I’m not, success can be hit or miss. Another way of saying this is that you can’t prescribe a solution unless you know what the specific conditions are. To improve employee engagement, we need data to help identify the conditions. Excellent article with some great insights!